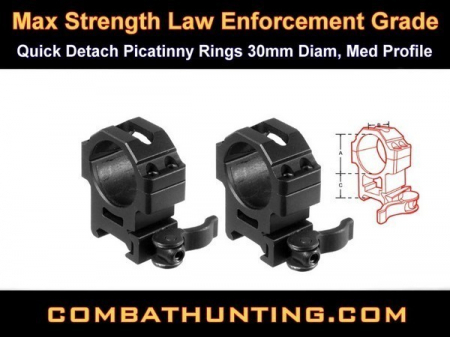 Leapers RQ2W3154 Heavy Duty Scope Rings UTG Law Enforcement Grade Quick Detach Lever Lock Universal Picatinny Mount Scope Rings 2PCs Ring Diameter 30mm Med Profile, Precision Machined From Heavy Duty Aircraft-grade Aluminum Alloy With Anodized Black Matte Finish. Ergonomic Quick Detach/Lock Lever Fully Adjustable to Fit on Any Picatinny Rail. High Quality Synthetic Protective Scope Tape Applied on Rings Internal Surface. Tight Tolerance Control and Repeatable Positive Locking for Optimal Re-zero Performance. Extensively Field Tested under Extreme Operations and Well Received by Field Experts and Law Enforcement Personnel. See-Thru Rings, Fits Scopes up to 60mm Objective Diameter 4 Steel-Bolt Hold Down Per Scope Ring Cap. Limited lifetime warranty.